When we moved to Utah we chose a rental townhouse with kind of a strange layout. There are 3 narrow floors with no basement so the first floor is just the garage and the living room. 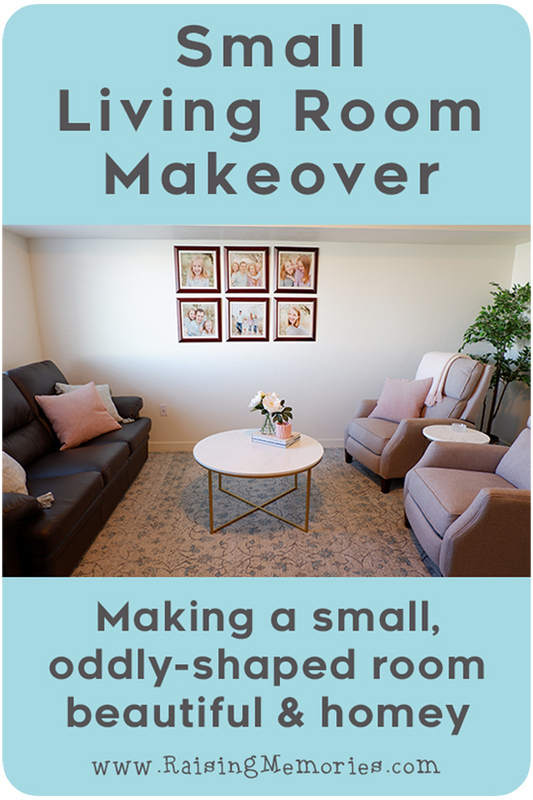 It's a fairly small living room with a few unique layout features that made it tricky to work with but I am so excited to share it with you now that we have it all figured out! We came to Utah without a lot of furniture, so I was able to start mostly from scratch in decorating this room. That was really fun but also very challenging because I was trying to do it on a very small budget. I wanted the room to feel beautiful and homey. I wanted it to feel cohesive and I think I was able to do that by choosing a couple of colors to focus on. I printed our most recent family photos (taken by the fabulous Ariana Del Mundo) to put in the 6 frames that we brought with us, and we were wearing blue and pink for those, so I decided to use those two colors as the accent colors for the rest of the room. I just ordered the prints online from Adoramapix and they were shipped to our home. This room was completely bare for several weeks after we moved. It had some boxes in it and some photos and mirrors leaning against walls, but mostly, we ignored it because there was nothing going on down on the first level of our home! The first piece of furniture we found was our couch and it sat in the room by itself, with no accent pillows and no other furniture, for a while. 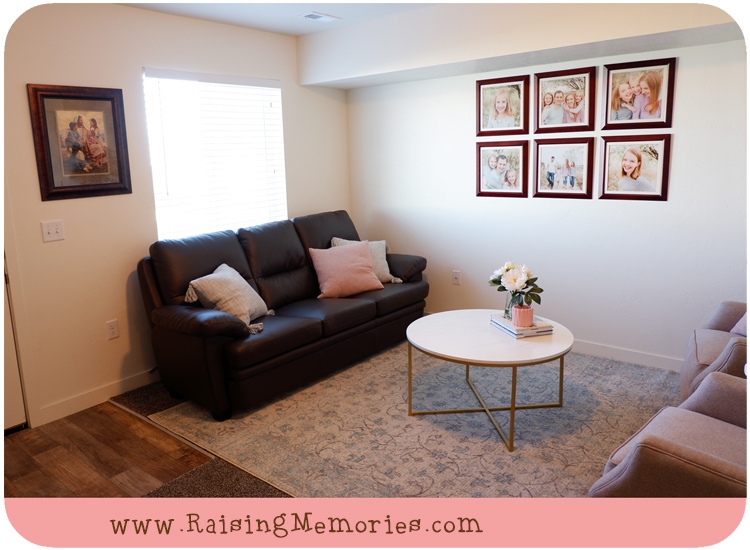 We so missed our leather reclining couch but we needed to furnish this room on a tight budget so we found a couch that looked like leather, for a great deal and we've been really happy with it! The next things to make their way into the room (about a month after we moved in) were these reclining accent chairs that we found at Costco! They sat in the room with the couch and nothing else for a few weeks before I started to figure out the color scheme and look for accessories and accent furniture! During one of my mom's visits we paid a visit to IKEA and found a plant to put in the corner of the room (shown in the above photo with the chairs) and the barrel bucket to put it in, shown below, from Michaels. I've never really decorated with flowers or plants before (aside from the odd potted plant that dies pretty quickly) and I've really liked it! I found the accent table between the chairs (shown above) with a marble top and brass legs at Target and then the round coffee table from Walker Edison. I love this table because it's pretty and it's lightweight and easy to move (since the marble top isn't real). 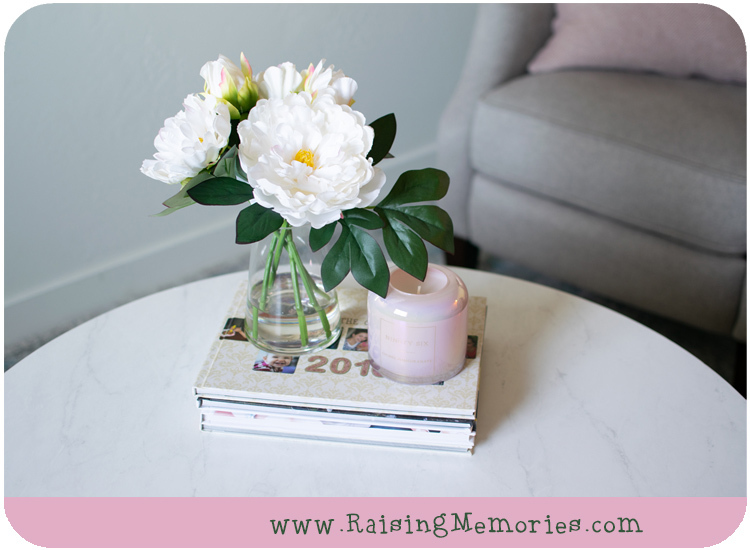 I'm displaying some of our photo yearbooks in a stack on it along with a vase of faux flowers that I found at HomeGoods and a delicious smelling candle (also found at HomeGoods). I have always wanted to hang some of our instruments so that they could be on display while having a place to belong that isn't just shoved in a case in a corner. 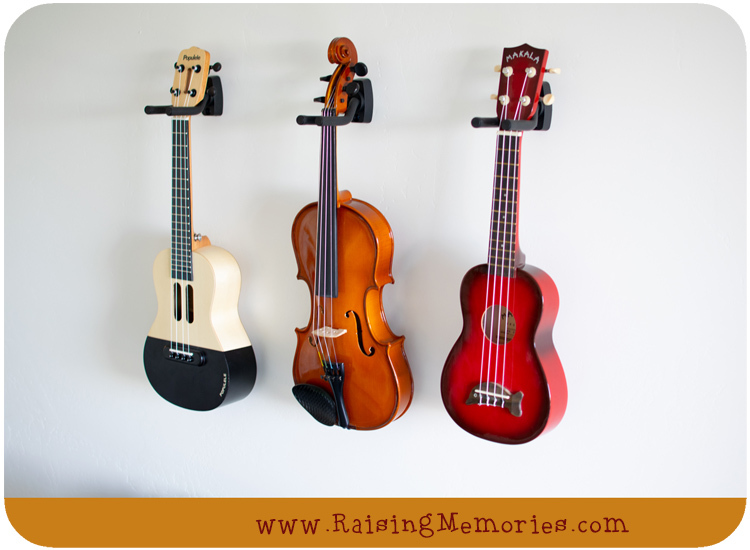 I was so excited to find these hangers on Amazon that would work for both the violin and our ukuleles! I have already found that people reach for them more often, so they are getting used more and they look so nice! 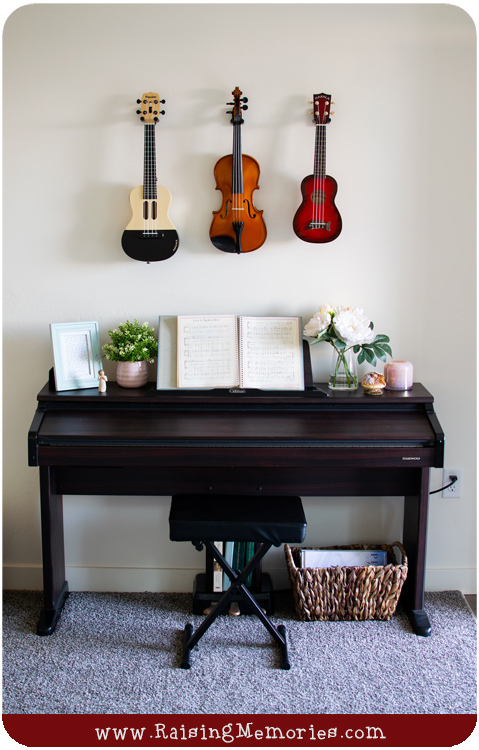 We hung them above the one piece of furniture that we brought with us for this room: our electric piano. In the photo collage below, I'll show you some of the details around the piano. In the top, left photo you can see a little fairy figurine. I have a collection of fairy figurines that I acquired over my teen years but they have remained in boxes since we've been married because I just didn't have a place to display them. I was happy to find a little place for my favorite one! 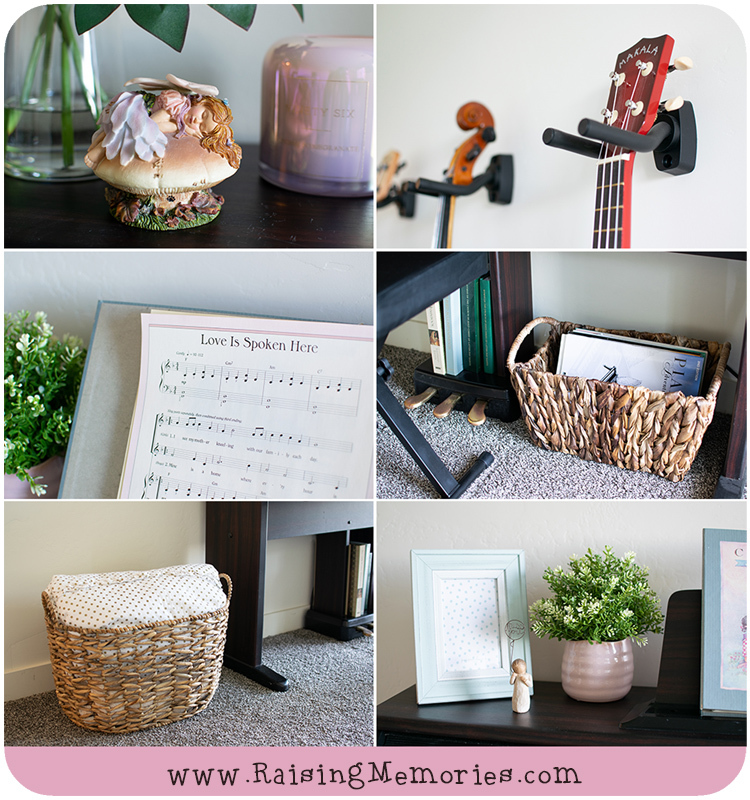 I also found a basket at Michaels to store our piano books under the piano and another basket at HomeGoods that I keep next to the piano with some extra blankets for when it's chilly and you need something to snuggle up with! 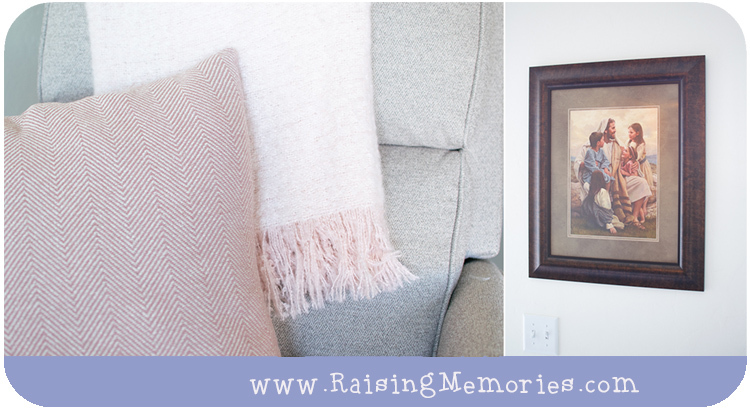 The blanket in the photo is from Beddys from when we did the girls' bedroom makeover last year. The bottom right photo shows a plant we found at IKEA inside of a beautiful pink vase from Michaels. I found the frame at HomeGoods (I will fill it soon with a photo!) and the Willow Tree doll holding a "Miss You" balloon was given to me by my mom when we moved to Utah. I found my pink and blue accent pillows at HomeGoods (you can see the blue ones in some of the other photos) as well as the pink throw. We already had the photo of Jesus with children and I was excited when I noticed that the clothing matched my color scheme! One of the final touches to the room, and the piece that really brought everything together was the area rug. I found it on Wayfair and thought it was the perfect touch because it had the blue color I was using, but it was also subtle which was what I wanted, to keep a calm, homey feeling in the room. 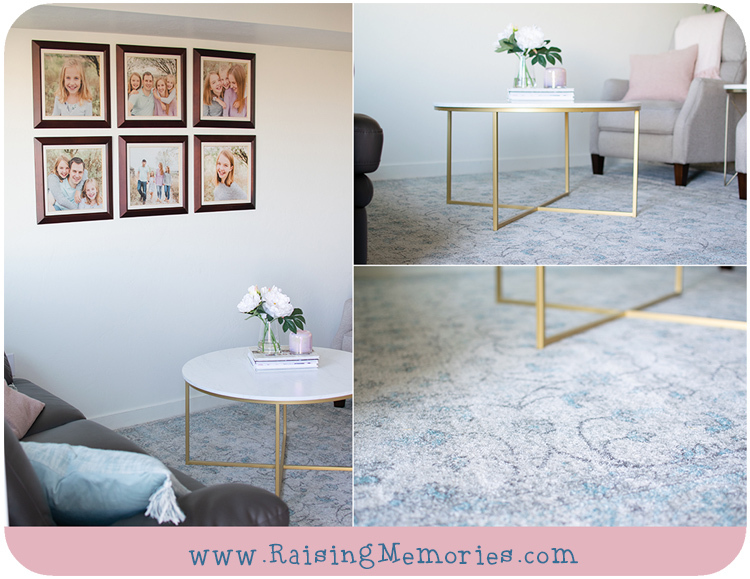 We had worked with Wayfair for the girls' coral & mint bedroom makeover so I was excited to find this rug on their website and am so happy with the way it tied the whole room together! You can find all kinds of home decor items on Wayfair (besides area rugs) and they have both a U.S. Wayfair site and a Canadian site, so definitely check them out! I'm so happy with the way this room turned out! It's the room you walk into when you come into our home and it's the place we visit with friends or cuddle up for a family movie. (We don't own a T.V. right now, so we just set up a laptop for those times). It's the cozy, pretty little space that I was hoping for and I couldn't be happier with the way that it looks and the way that it makes me feel! Thanks so much for coming along with us on this journey! I hope to share some more posts with you soon about how we're making this rental townhouse into a home. Disclosure: This post was in partnership with Wayfair. Product was provided to facilitate this post. All opinions shared are, as always, my own. 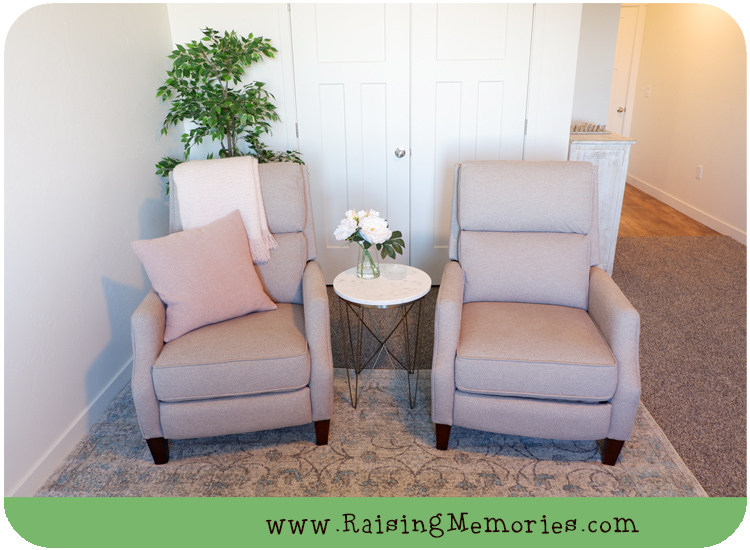 I love how you transformed this space into a cozy little nook. I loved your fairy figurines. I had angel figurines when I was a teenager, but gave them all away when I got married. The hooks for the violin and ukeleles are really nice and functional. You did a good job! 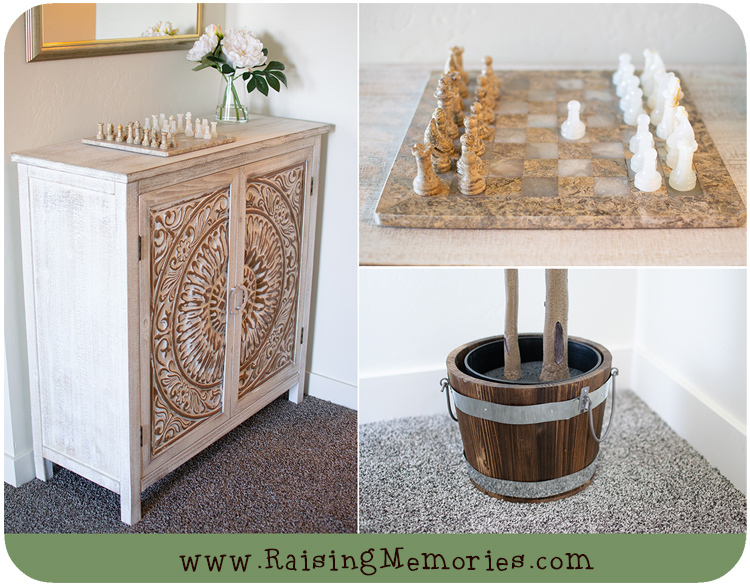 The simplest things can make for the most beautiful, when it comes to decor. I am very impressed with this! Thank you so much, Kerrie! I'm definitely liking all of the little accents. The use of plants was great. I have to start thinking along those lines more when decorating. You're good at decorating, it looks beautiful! I would want to have people over more often if I had a nice place to sit with them in like this. Thank you Kathleen! :) I have to say that I consulted with my mom & sister a lot while trying to figure out what to do with this room! I learned a lot! I find so many amazing home decorating pieces at Home Goods! They always have the best finds ever!! I agree! I love going in there to window shop and often wish I had more rooms that needed decorating so I had a reason to buy more! haha! I love the lightweight look of the coffee table. Very inviting but not overpowering. And the hanging instruments! I really need to get our guitars out and on display somehow. The room looks fantastic. I love all of your great finds especially the cabinet for your board games. Fun to shop around, so much to find these days. I love shopping for sales! I like the hanging instruments, unique. I love it! Looks so cozy! 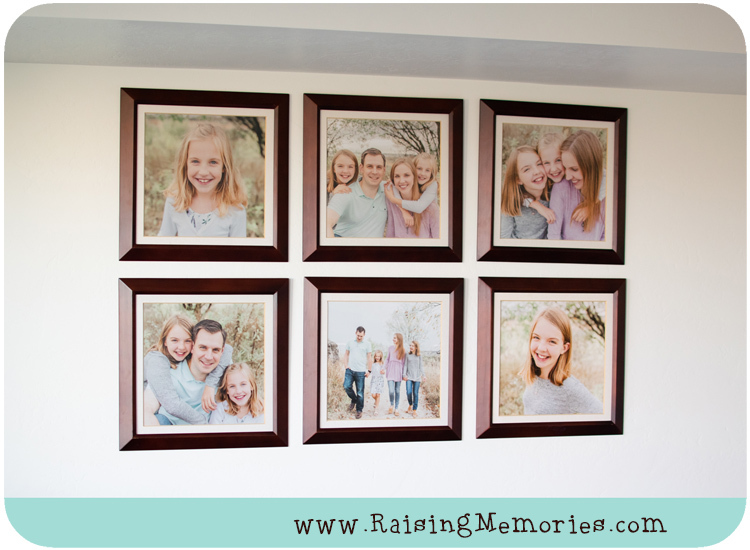 And those printed family pictures are really awesome! Turned out great and I love your colour theme, I wouldn't have known what to do with such space, but you figured it all out and I love it! Thank you! I'm so glad you found it helpful! Wow, such a beautiful transformation! It so beautiful, it looks clean and pleasant and the ambiance become more welcoming. I love how you transformed this space into a cozy and inviting room. The recliner chairs are gorg! My hubby would love one of those in our living room. I love the subtle pops of pink such as the throw blanket and candle. I've been looking for other brands of candle aside from Bath and Body Works. 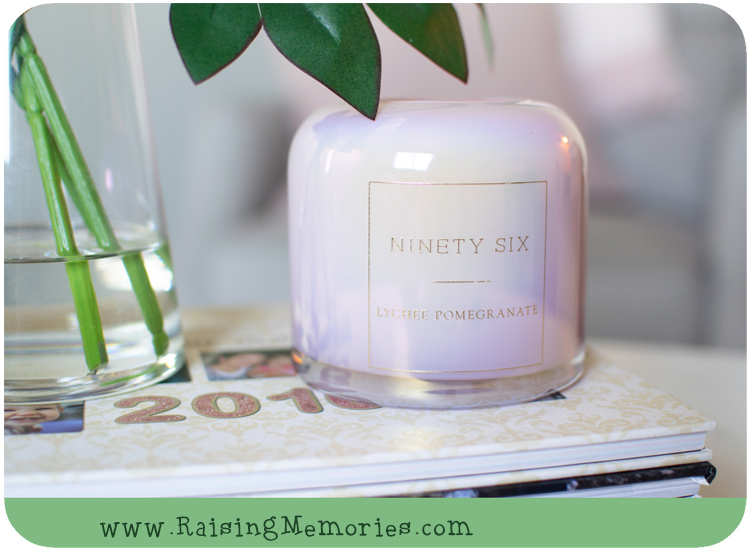 So I definitely want to look into the Ninety Six candles and give them a try. I love the jar your candle came in. It would definitely be repurposed for me. LOL. And the cabinet. Wow. It's ABSOLUTELY GORGEOUS!!!! You did an awesome job with this space, Heather! Wow that is amazing! I love how you kept the closet accessible. And that coffee table is perfect in the room. I love how a round coffee table makes a small room feel bigger. This space looks so inviting! I love the look of those chairs and would never guess that they are recliners. Yes, they recline! :) I just looked at Costco's website and I don't see the same chair, but I do see some that are similar and recline. Good luck! Well done! We are currently trying to furnish an oddly shaped room in our home! Thanks for the inspiration! I really liked the little touches you added. You have a great eye! I totally love this and the photos are amazing,you have great taste! I love this beautiful room, simple but yet looks so comfy and cozy! What a cozy-looking sitting room! I do so love the dark blue with the pink. It looks really nice. I especially like the cabinet. I love how you decorated the room. It looks great! I love what you did with the ukuleles, that was a great idea!! Feels cozy and comfortable in the living room, I like the shades, pretty comforting! I love the colors you choose to use! The coffee table matches great in the setting!